Lauren Kenney is the founder of the Guelph Vintage and Makers’ Market (VAMM), a series of events that bring creators, makers, crafters, thrifters and purchasers together to support locally produced and often handmade goods. Lauren is also an advocate for the sustainable production of all goods. With passion for design, community-building and advocating for change, Lauren is a leader in local event production, innovation, camaraderie and environmental impact. 1. 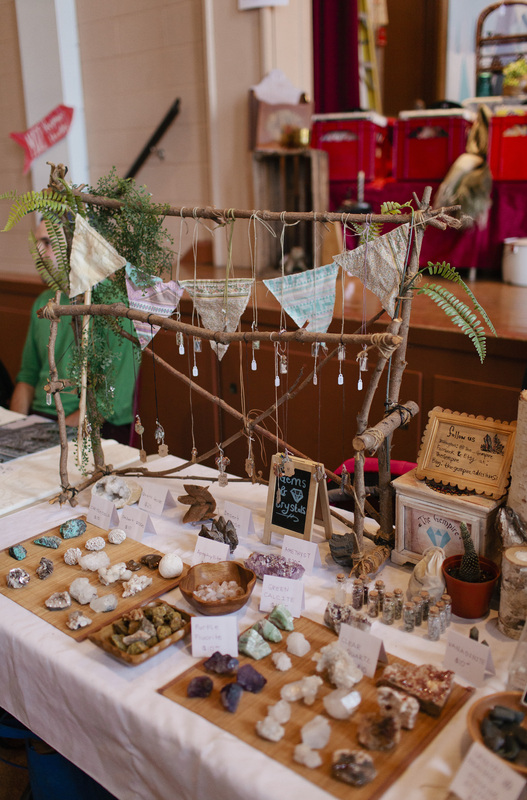 The first ever VAMM was held in 2015 as a way for like-minded people to unite and celebrate their love of slow-fashion and handmade goods. What prompted you to create an event like this? The VAMM started out of my love for making things and seeing what others have made. Naturally, I have always been a fan of this type of market. I wanted to meet other makers and thought that organizing an event like this might be a good way to do that. And it worked! 2. What was the most rewarding part about hosting your very first VAMM? The people were through and through the best part of the event. At that time, I had thought that the market would be a one-off event, but have ended up organizing markets for three years, consistently. I really enjoy all of the preparation and planning that goes into each market. As long as people still want to participate as vendors and the community still wants to support them, I will be thrilled to arrange a space for that to happen. 3. The most recent VAMM took place in December 2017. Within the span of three years, what type of growth have you seen with the VAMM? Since we have been around for a few years now, many people have attended the market and become familiar with the products we usually sell. The most notable change is that each year we have had an increase in vendor applications. It is exciting to see that vendors want to share their creativity with us, but it is also difficult, because we do not have enough tables to accommodate every talented person who applies. 4. After finishing the event in December, is there anything you wish you could have told your 2015 self in advance of the inaugural VAMM? My 2015 self needed to take a deep breath. I had toyed with the idea of organizing a market for a few months prior and had put in an inquiry with the chosen venue, but honestly never really thought it would come to anything. Only six weeks before the actual event, I got a call from the venue to ask if I actually wanted to book the space. I said, “ Yes,” but I had no idea what I was getting into! I have since learned to be better prepared and kinder to myself by starting the behind-the-scenes work months ahead of time. 5. Why is supporting small businesses and entrepreneurs so important to you? Was this always something you valued? Yes and no. My family was always very into crafting and making things as I was growing up. When I was really tiny, my mother had a stall at a farmer’s market in Ithaca, New York, where she sold matching mother-daughter dresses. So, I guess that is where it probably started, but I didn’t really understand the value of small business and entrepreneurship until I got a bit older and entered that landscape myself. It is really difficult to start a business and put yourself out into the world. There are so many personalized perks to shopping with small businesses, that it is a shame not to! 6. What do you hope the community learns from the VAMM about slow-fashion, investing in handmade goods and buying from small businesses? Over production and fast-fashion is a big problem for both the environment and the welfare of those who are making the products. In developing countries, the labour is inexpensive, meaning that there is a strong chance that the person who pieced together your favourite shirt was not paid a living wage and it is likely that they spend their days working in dangerous conditions. In an effort to promote slow-fashion, we aim to have products available that are consciously chosen as either vintage or created locally. If it can check both boxes, that is extra awesome! When it is possible, spending a bit more money on things that are well-made and will have a longer lifespan has a huge impact. I hope that the VAMM provides a space to bring small businesses and their community of supporters together. 7. With the rise of e-commerce and platforms like Etsy, it’s become a lot easier to buy from local makers. That said, why are markets like the VAMM still vital to the growth of these entrepreneurs and creators? The majority of our vendors also sell on Etsy or have their own e-commerce stores, which is awesome. But, as nice as it is to shop from the comfort of your own home, getting to hold your product before you purchase it and having the opportunity to hear about what you are buying from the person who created it has a certain merit. I learn so much from our vendors every year and it is inspiring to be around people who are so passionate about what they do. Many people that make purchases at events like ours will take a card from vendors they are interested in. [Vendors and purchasers] get connected in other ways too, by telling friends and spreading the word about the local gems they have discovered. 8. What’s one thing that we can all do every day to better support small business and entrepreneurs? We can easily support small businesses and entrepreneurs every day by taking opportunities to buy their products or services, or by making a connection with a friend who might be able to. Even an action as small as responding as “Interested” or “Going” to an event on Facebook will help spread the word to people in your network. 9. How would you say the VAMM benefits the broader community within the Guelph, Kitchener, Waterloo and Cambridge areas? I hope that the VAMM helps to grow the sense of community within Guelph and neighbouring cities. We have had a fair number of vendors travel to Guelph for the VAMM and lots of shoppers who do the same. 10. For those of us who might not work in the event industry, how many hours would you say you put into planning and preparing for market-day? Oh my goodness! It must be a few hundred hours, broken down into any spare moment I have in the weeks leading up to market day. I have a blast doing it, but it is definitely all-consuming. 11. Who makes up the VAMM team? What type of team growth do you anticipate 2018 will bring? Behind the scenes, the VAMM is just me (and my awesome husband, who takes care of everything while I become all-consumed with market related things). On the day of, I have an awesome crew of friends and family who help set up and make sure everything runs smoothly. We aim to always have someone around to look after a table while the vendors take a break or do some shopping themselves. The vendors also continue to amaze me with how generous they are with their time and willingness to help in any way. 12. While the role of event producer does indeed qualify you as a maker yourself, what other projects are you involved in, when not working on the VAMM? Aside from market planning, I work as a freelance designer and illustrator. The two really go hand-in-hand, because I get to work with other entrepreneurs and help them put their best foot forward, creating content that is more than a pretty image and will both effectively communicate and leave an impression. You can find out more about that at laurenkenney.ca. 13. With 2018 already in full swing, what do you hope this year’s VAMM will look like? This year, I am hoping to expand the type of events that we offer and tap into the awesome community of skilled people around us. Maybe some workshops? Maybe some lectures? Definitely more markets! Lauren launched the inaugural VAMM website as part of preparations for the event in December. Click here to view the new site! You should also follow the VAMM via Instagram and Facebook. Stay tuned and mark your calendars for all upcoming markets. Congrats to Lauren and everyone on the VAMM team on the impact you’ve already made in southwestern Ontario and beyond. We can’t wait to tune into future workshops, lectures and markets. Maybe a podcast too?